Here are the leaders of the Detroit's late sixties heavy rock/proto-punk scene. These excerpt from the concert at the Cincinnati pop festival in June 1970 is, as far as I know, the only Stooges' video available (not considering the recent reunion...), the only time Iggy and his band have been shooted for television (they were not the kind of guys you would expect to see as guests on a TV show...). Despite the not perfect quality, it is an unique chance to see the young and angry Iguana on stage. His memorable perfomance has been reviewed on Julian Cope's site at this page, and also Lester Bangs was impressed enough to describe it in an article. The MC5 bring their high-energy-revolutionary rock 'n' roll on television in 1970 too. Here they mime this song from the Back In The USA album. Though there are others MC5' s clips available among file-sharing people (they also perfomed live at the Beat Club in '72), I think this one is a little more rare, and gives the chance to look at their typical action on stage anyway. So, there is a chance to see more MC5's videos in the future. 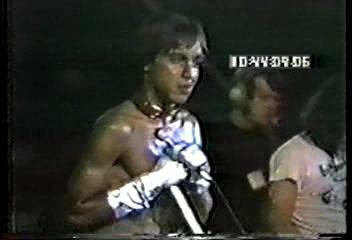 Thanks for The Stooges footage Mirco! Awesome stuff! What a real pity theres nothing else in the way of vintage Stooges footage but thank goodness this survived. Julian Copes essay on this is excellent and hits the spot. Sarà fatto, a presto un post intitolato Kick Out The Jams!